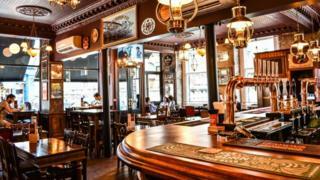 A Scottish independent pub group is seeking to raise £20m to fund its expansion through acquisitions. Edinburgh-based Bruce Group Scotland, which owns 19 pubs in and around the capital, is issuing a bond to fund growth over the next few years. The group was founded in 1999 by Kevan Fullerton and Scott Piatkowski. Its portfolio of bars, clubs and music venues includes the Royal Mile Tavern, George IV Bar, Whistlebinkies and La Belle Angele. The group said it was seeking to expand after experiencing "considerable growth" in recent years. Mr Fullerton said: "We believe that the pub market currently offers excellent potential for growth and profitability and we have the scale, expertise and knowledge of the market to expand substantially in a relatively short timescale. "We think that our model, extended across Edinburgh and into Glasgow and the central belt, will produce a profitable pub group which, although centrally owned and operated, retains the individual identity and character of each pub. "We are not creating a chain, we are building a group of individual pubs which nonetheless benefit from experienced management, strong financial backing, and the cost savings which a large group can command." The bonds are being traded on the NEX Exchange Growth Market under the name Bruce Pubs plc, which is a wholly owned subsidiary of the Bruce Group.